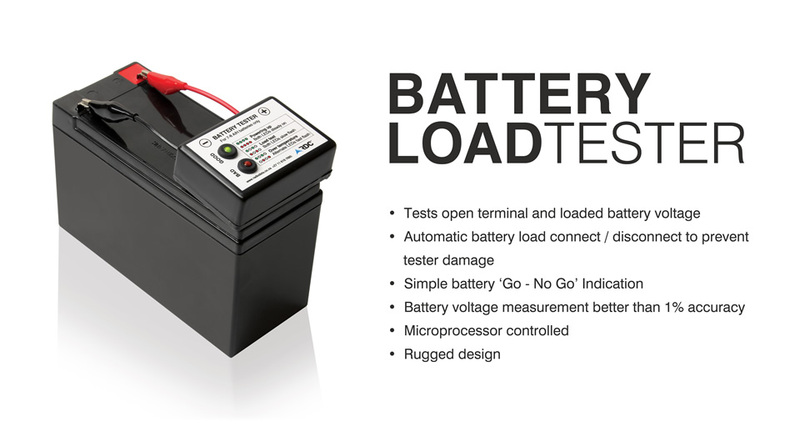 On connection of the tester to the battery, the initial indication is that of the open terminal voltage (no battery load) and based on these typical characteristics, the tester has been calibrated to reflect 'Good' when the battery has a residual capacity of approximately 40% or more. While in this state, any change of open terminal battery voltage above or below the 'Good' threshold will be immediately reflected on the 'Good' / 'Bad' LED's. After connection of the tester to the battery, a settling delay is employed to ensure that the connection to the battery is stable. Following the settling delay, a load is automatically placed across the battery terminals for measured specific time. The current drawn from the battery is used in conjunction with the drop in terminal voltage over the measured time to determine the state of health and state of charge of the battery under test. During the load test, both LED's on the tester flash simultaneously. While in the load test phase, should the battery terminal voltage drop below a point considered to represent a battery with a residual capacity of 15% or less, the test is immediately aborted and the 'Bad' LED is illuminated and latched in this state. Should the battery terminal voltage then recover above the 15% residual capacity level as is most likely to occur when the load test is aborted, the tester will continue to indicate the 'Bad' state until disconnected from the battery. If after the load test has been successfully completed, and the battery terminal voltage remains above a pre-determined level, the tester will calculate the state of health and state of charge of the battery using the values obtained during the load test phase. The result of the final calculation will be reflected on either the 'Good' or 'Bad' LED and will be latched until the tester is removed from the battery. to a safe level. Additionally the tester is potted in a flameproof / fireproof compound that also gives it residual strength. The insulated housing provides a high degree of protection against any possible lethal voltages that may be present on the terminals of the tester should it come into accidental contact with exposed mains wiring. It should however be noted, that although it is perfectly safe to keep the battery tester connected to the battery under test for prolonged periods after the initial testing has taken place, this is undesirable due to the fact that there is a small current drain which will eventually completely discharge the battery. It is therefore recommended to disconnect the battery tester immediately after testing. This tester is calibrated for 12V batteries with chemical compositions of 7 A/h SLA batteries and 8 A/h gel cell batteries. It may be used on higher capacity batteries without any damage to the tester; however the indication as to the state of health / state of charge of the battery may not be completely accurate. It is not recommended that this tester be used on batteries below 7 A/h rating. Before performing any test, completely isolate the battery from any load such as an alarm panel / gate motor control circuit / electric fence energizer and / or is associated charging circuit. This is important as any external load on the battery or applied charging current will result in an incorrect assessment of the battery HEALTH. Connect the tester to the battery using the red and black crocodile clips, the correct polarity should be observed i.e. red lead / crocodile clip to the (+) or red terminal and black lead / crocodile clip to the (–) or black terminal of the battery. If the tester is incorrectly connected to the battery, no damage will occur, however the battery test cannot proceed. Once connected, both the RED and GREEN LED's will illuminate and stay illuminated during the settling phase, thereafter both LED's will begin to flash slowly. During this slow flash, the battery tester will be performing a load test. During the load test the enclosure of the battery tester may become warm, this is normal. After the load test, the battery tester will indicate a good or bad condition on the RED or GREEN LED's. If at any stage before or during the testing, the voltage to the tester drops below a residual capacity of 15% or less, all testing is terminated and the RED led will illuminate to indicate that the battery has failed the test. tests be performed in a 5 minute cycle followed by at least another 5 minutes of cool off (at an ambient temperature not exceeding 25 ̊ Celsius). If repeat testing is performed without adhering to the 3 tests per 5 minute cycle recommendation and the tester becomes too hot, the tester will automatically enter a self protection mode, where both LED's rapidly flash in an alternating pattern. This self protection mode will last as long as the internal temperature of the tester is too high and is a protection against tester damage and possible fire risk. Should this occur, it is recommended that the tester be completely is connected from the battery and left to cool off for at least 20 minutes. It should also be noted that the accuracy of the testing will be severely affected well before the tester enters the self protection mode. If the testing of batches of batteries is required, it is recommended that more than one battery tester is used and the testers rotated to allow each tester sufficient cool off periods before it is used again.